Airtime Solutions By Industry Radio System Boston Massachusetts Comtronics Corp.
Getting materials to and from jobsites is time sensitive. That’s why effective voice and data communications is a necessity. Our system can offer your drivers clear, digital communications to other drivers and to the office. 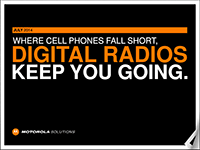 Using Motorola’s MOTOTRBO Digital Radio Platform, the system offers clarity and range that significantly outperforms traditional analog radio systems. You can select a single site for local coverage, or multiple sites for wide-area coverage. Unlike mobile phones, our radios are not restricted by the U.S. Department of Transportation — they can be utilized by drivers while they are operating a truck, helping to ensure the constant connection you need to obtain maximum collaboration and fleet efficiency. Transporting students safely is a foremost priority for School Transportation Directors, Drivers, Administrators and Parents. Dependable radio communications that talk clearly throughout the school district is a must. Fast and cost-effective wide area coverage to provide reliable and seamless push-to-talk services to drivers that spend their days out on the road. Real-time voice and data communications with dispatchers and drivers keep your business running and customers satisfied. Towing companies need clear communication and fast response times when clients need their services and GPS vehicle tracking. Please click here for a demo of our digital two-way radio system.